(12-12-2017, 01:29 PM)agnesi Wrote: I thought Three Kingdoms were out of rotation? Imperial Warlords are gone, Yamato was moved from Seal 2 to Seal 1, and Knights of the Round Table has replaced Yamato in Seal 2. Yamato is clearly the better prize, but Seal 1 is full of questionable older cards, like Norse, Greek. Seal 2 is overall better quality, but Knights rares are pretty much all bad starters, except maybe Lancelot, but that's a little questionable as a long term investment. I guess by exclusive seal release order, Yamato will leave and Sengoku will swap in next patch? I guess it might be a good idea to just go over all of the exclusive seal rares, with a note on which ones are currently available in the diamond seal pool. The ideal strat for rerolling should be Seal 1 and aim for Izanagi , RGB Origin demons or Pontos/Erebus. These are all the cakewalk leaders that simplify the board / dissolve and recommended for beginners. Origins is in Seal 2. Izanagi and Pontos/Erebus are in Seal 1. If you're rerolling you have to draw from one pool, so you have to pick between drawing for Izanagi/Pontos/Erebus in Seal 1 or for Origins in Seal 2. So IMO, it's a good idea to think about quality/quantity of starters in a given side of the seal, since that's going to affect how long someone spends rerolling. Past week I started a new account, on the first day I reached lvl 150 by just spamming Exp Crash course stage while watching tv, from rewards and clearing some stages in lost relic I got a total 50 diamonds without touching story mode even once. I'm going to use the draws of this account during cny. I've started to clear stages with ease by using Matthew+Atlantis lol, filler member are those water mobs that you get as reward from leveling up. Right now is a good idea to create an account like this because of the extra diamonds of MadHead 5th anniversary. (12-12-2017, 01:11 PM)Oriceles Wrote: You can also rename those files and play different accounts like that. I've actually been working on a script that runs through the 5 accounts I've created with various good members. It's not quite finished, but does present a menu of account to load, loads the account, opens TOS. When you're done playing, go back to the script and hit enter and it'll save your current xml file into the backed up one and exit. I'd like to change it so it loops back to the menu, and I'd like to be able to take a snapshot. This is not dezd yet, just got sidetracked with exams and then with Hand of Fate 2 and 100% Orange Juice (great game! anyone here plays it?) with a little of Factorio too. I did add a few series in the first post the other day but now I will try to finish at least the available cards (will edit them into the first post later). The best mono beast leaders this archetype can clear most of the game like the standard dragons of old. Beasts are known for their high hp, good attack and low recovery and if you look at the leader skills none give a recovery multiplier flat or increase in recovery but Aloha, Dodo and Haza make it so you recover some hp for each rune dissolved (increased by combos if I'm not mistaken) which might not look like much but it ends up being a lot thanks to the number of runes dissolved and the best part is that there is no team skill so you can ally an All Max Dodo or Aloha or Haza and reap the benefits. Sumatra gives more damage and Suzuko is great to get the actives fast for those stages where you can't stall much. Now, normally I wouldn't recomend a team with restrictions like only beasts but the truth is that a lot of great beasts are in the friend point seal which means they are somewhat easier to get than good members of other races. Some may argue that Fury is key but even without Fury it is still posible to use beast teams, just a little more bothersome. This not only require the investment to VR (luckily it only requires three demon pr mat or one and a dupe) but also they are somewhat glass cannons or YOLO teams that work best with one or two short cd converters to keep the runes flowing and the multiplier up. They don't require their SM (Robert) in their VR form but Elizabeth and Jackie have the Haunted Object of their same attribute to give more hp and damage to their attribute demons making the best teams for them a little more restricted. Jack and Todd, the light and dark Blood Fiends respectively, are mono demom grind teams of their attribute so they are not recomended and not used much. Mono light human leader that is powerfull with the right members, sadly there are not many good light currently obtainable thanks in part that a lot of the good ones comes from collaborations that where retired. Thanks to that I can't recoemend it for a new account (but if you have the members, go ahead that it is powerfull). Overshadowed by the Perenial Elves, the active works best in very specific circunstamces so pass it. It was a try to revive a really old meta of Fire-Earth-Dark meta (counterpart to the water-light meta) that didn't really take of until the King of Fighters collab (sadly retired) so it might work allying Kyo, Mai or Iori from KoF but it is not that great, on the other hand Lancelot is a great member for dark but probably a pass. Overall, seal part 2 is not that great right now so aiming for part 1 or Prologue of the Universe is better. I will porbably change Lancelot a little before putting it in the first post but I want to get this out and have to do something else right now. All great leaders, sadly a little left behind but still good leaders, Chessia and Satan both explode hearts and the runes of their attribute have the effect of heart runes so they attack and heak with the same runes but both have a secondary condition of dissolving three or more types of runes to trigger the full multiplier which makes stalling easier than Izanagi. Abraham true power comes from the extra combos from the leader skill which makes it skill dependant and Atlantis is kinda like Abraham but better, still a pretty good leader though specially it's recovery. Okay, the three are a little skill dependant but for abraham to trully shine it needs 6+ combos each turn you want to attack plus the need of water runes for the team skill makes him not so good for a new account, Chessia and Satan three attributes dissolved is easier to do and they only have five attribute when you spin (no hearts on the board) which can make spinning easier. From the three of them the better for a starter account is without a doubt Stan because most of the damage comes from leader and ally Satan so you only need to max her to enjoy most of the damage and can put wathever you want as members. Sadly this seals rares all have multiplier for humans, they are not bad (Hideyoshi and Nobunaga are pretty good leaders, Honda is not popular but can be powerfull) but the limited card pool for members make them bad starting choices. Hidyoshi for earth humans (and only) when dissolving 6+ earth runes in the round and let's just say that there are not that many earth humans, quite a few are from collaborationss that will not come back. Nobunaga has multiplier for fire humans and fire dragons and while there are quite a few good fire humans the fire dragons could be better, the problems is that there are not many of both of them in the series commonly in the diamond seals so he is probably a pass as well. Honda is not exactly a human leader but you need to have two human members apart from the leader and ally (so 4 in total) to get the full multiplierwhich is not that great. The real value of Honda is making a team of water and light members and triggering the passive that makes it so water have the effect of light and light the effect of water. Cool and with a somewhat bigger card pool but the need for the two human members make him a pass. Ophiuchus is good leader that can use any god and any elf as a team member, this makes him a rainbow leader with quite a large pool of members to choose from, the leader skill multiplier can look low but the team skill can be activated simply by going back and forth a few times in a row plus the fact that it converts runes to enchanted means that it can simplify various enemy shields. All in all a great leader that is definetly a keeper, just don't go with too many attributes when making a team though and the team requires to have at least one elf. Andromeda was released in a time where elves where in a bad spot and MH was trying to make a water elves meta then the Perenial elves released and elves became meta again but even when Andro was released Sera and Shuta where generally used as leaders over Andromeda for water mono elves teams. The fact is, Andromeda is not the best leader but she is an excelent member because her active is extremly good because the extra attacks have do the same damage as her normal attack (and if I recall correctly, she also launches an extra attack so dissolving all attributes means Andro launches six attacks), pair with Cassandra to boost her damage. Okay I maybe dissnissing her too much, yeah it is posible to play her like a Satan or Monster Strike Margarite by focusing on her damage but there are better leaders out there like Cornflower so poor Andro is now a follower. Lynx is, mmm, look I like Lynx and the archetype is quite interesting but she is a horrible starting draw because she NEEDS dark beasts (although unevolved Lynx can work as a rainbow beast leader just aim for the others please) which there are not many so don't start with her. Funnyly enough whe she was released she was pretty terrible because the number of usefull dark beasts at that time was maybe four or five but then MH started releasing more dark beasts and now there is a good amount of utility (but not too much) and MH will probably add a few more dark beasts to buff her. So they work best in an elves only team but they Cornflower and Sakura can work with not all elves team (Rose only boosts elves so only use elves with her). 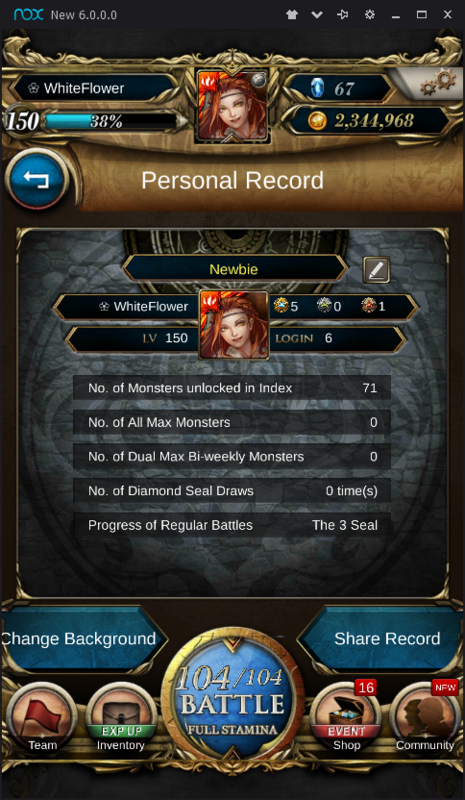 Anyway, the amount of elves in the diamond seal is not much so the best time to keep Sakura or Rose as a first draw if there Garden of Thorns seal (elfish perenials card seal) is open or if MH releases another elven heavy seal, othe than that Cornflower is the best one to keep because he can work as a mono water leader, I mean having a base multiplier of 40.5x just for using him as leader and ally is good, add on top it can be 50x by dissolving two groups of water in the first batch or 91.125 for just dissolving hearts in the first batch or 112.5x for doing both or a shield of around 50% by not dissolving water in the first batch and you have an excelent leader. And that should cover all the separate seals rare, was thinking of doin the black cards but I get the feeling it can would be pretty much something like: the two brides are weak now, Iron Fan is an excelent member for earth teams but not a good leader, Tang Sanzang is restricted although it looks like the leaders skill doesn't need it to be all light for it to work so eh it could work, to get the most out of Maya you need ML and high team cost so pass her, Anubis and Atlantis keep them. This is really coming together. Thanks for all your hard work. Shame I can't give you more rep since I was the last person who gave you rep lol. Going to put my thoughts on the rares of the seal, probably biased cause I'm bummed that I did 16 draws and only got one of the rares (Farady) and the trial stages was, ehhh. After a few days and more opinions/videos are out gonna update it. The super duper rare with a low 1.5% chance of getting her but a guaranted every 35 draws. A rainbow machina and human tank team, this seal only has three machinas (Turing, which Mobius is the other rare and Froid a common) the other machinas are either the cyborg scholar machina evolution or farmables which are not available right now (yeah, counting Lionel and his evolutions as farmables) so you want humans in the team, luckily most of the humans in this seal create hearts so that's good. Tank team because it has a multiplier of 16 which is low but also has a 1.69x to health which helps survive plus the fact that it can attack with hearts, the multiplier was probably balanced to use the fuel mechanic. Good members from this seal are Mobius (but not the conversion part), Froid, Chang'e, Celsius and Hubble (kinda, you want a good amount ofwater, fire and earth on the board before activating the skill). When I say good I mean that they work with Turing but not necisarily that they are great. Yep, this is pretty interesting. Getting a full machina team is not easy if you don't have any previous machina cause of the three in this seal two are rares so you will most likely end with 4 Froids (which depending on how the active interacts with multiple copies could be usefull) which at least gives enough cd to have a shield every turn if you have 4 so it's something I guess. You can use non machinass in the team but then it losses the passive enchant (which helps to get the full multiplier, specially with cards that are not max skill lvl) and water equal 50% all attributes but maybe it's not so bad if you put persistent effects or rune enchanting actives and focus on the damage done by the leader and ally pair kinda like Satan. Problem is that there are not any persistent effect in the seal so it must come from other draws which makes it not that great. The water humans of the seal can work to provide enchanted runes and so does Froid but the other huamn cards don't help toio much. I feel like this can be a powerfull leader but you can only use light humans which limits a lot of team building options and actually makes it an alternative to Arthur in which most of the good light humans are not obtainable right now. The difference is that there is another light human (Hubbl) which kinda works, sure you don't get the full multiplier (you can but it depends on the skydrops) but it makes much, much easier to trigger the 30 runes dissolved part of the leader skill (still requires some skill so it is not that great for newer players) and it looks like MH is releasing a few light humans in this patch that works with her so it depends when you make the account but I would say that check if there are currently farmable light humans, if there are then Faraday can be pretty good. So let's go with the nice first, Prologues are in seal of the engraver part 1 so go nuts! Aza (although restricted is still damn strong by itself), Groth (multiplier for a few races but not limited to them, decent rainbow leader fine if you use other prologues as member but let's face it Ghroth has one of the most broken active skills in the game, specially broken for arena) and Daoloth (easy leader with a good amount of farmable members make Daoloth a pretty good starting leader) are all good first picks. Now the underwhelming, Imperial warlords 2 are in seal of the carver which is, let's just say underwhelming. Sun Ce is good, yeah but extremly limited for a new account. A rough counting of still obtainable (basically non-collab) 5 to 8 stars water humans is around 20 counting farmables so it is really limiting and not recomendable. Xiahou Dun has a really nice pool of members, roughly 3/5 of all available cards (althugh the active favors humans and demons the active most of the time is negible) with a good multiplier and a pretty nice passive conversion that helps the fully activate the leader skill and all members ataccking would make her a strong first pick but she just feels weak without extra additions, a few being farmable though. Zhurong follows the trend of fire multiplier, race multiplier, benefits for having member of that race and fire runes having 50% the effect of all other attributes. Zhurong is a good rainbow leader that is better with humans. First thing first, the three of them can switch to another form at cd 6 which slightly increse their leader skills, have a secondary effect the turn it's used and changes the active skills. Also Yusuke changes from human to demon which most of the time is inconsecuential but can be situationally important. Let's face it, the three are race leaders with benefits for certain attributes (water and light for Yusuke, fire and dark for Hiei and all attributes for Kurama), the races have to have only human, elves and demons for both Yusuke and Hiei while Kurama can only have elves and demons (probably because the all attributes runes have the effect of all attributes would be broken with enchantresses). Human and demon is a good enough pool to try to get from engraver-carver seals (probably on par or a little more than gods without counting the rotating separate seals) while elves are a nice adittion so all is good there. Normally I wouldn't recomend Kuruma with only elves and demons but because of the true rainbow effect of all runes have the effect of all attributes there is now downside to putting any elf or demon you have lying around, that's not even mentioning the multiple active skills on Kurama have a nice versatility and one makes him do more damage and is kinda persistent.